With much anticipation the Hampton Inns and Suites in Hood River is now open and ready to cater to your traveling needs. With easy access on and off of I-84 Hood River’s Hampton Inns and Suites is perfect for the traveler on the go. With so many activities to do in the area, you know you will always have a great place to stay for the night. The indoor hot tub and swimming pool will come in handy if you have been out enjoying any of the many physical activities that are so plentiful here in the Gorge. If you are still in need of a little exercise, the fitness center is the perfect place to visit with state of the art exercise equipment. According to manager Tim Pyle, Hamptonality is their culture and motto. “It’s being friendly, authentic, caring and thoughtful in everything we do. Every employee exudes this mantra and it’s what sets us apart from other hotels. We are so confident we’ll provide every guest with amazing Hamptonality that we offer a 100% satisfaction guarantee. If for any reason our guests are not satisfied, they don’t pay,” he said. Hampton Inns & Suites Hood River has 88 rooms, free hot breakfast, coffee makers, microwaves, refrigerators, and workstations in every room. Upgrade to a river view suite for a room with a separate living area and sofa bed. The hotel is located at 1 Nichols Parkway and the front desk can be reached at 1-541-436-1600. The hotel is being managed by InnSight Hotel Management Group under a licensing agreement with Hilton Hotels Worldwide. InnSight Hotel Management Group is a full service, award winning hotel management company headquartered in Springfield, OR and operates hotels throughout Oregon and Washington. 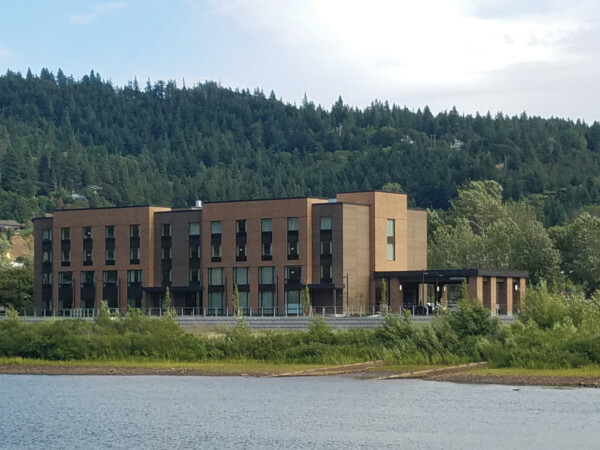 InnSight is experiencing rapid growth, with five hotel openings within the next year and five projects that will begin construction over the course of the next year throughout the northwest. InnSight provides development services, operations management, human resources management, digital services, sales and revenue management, as well as financial management.